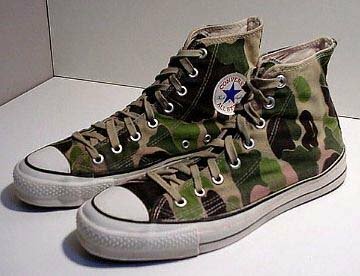 Photo gallery of camouflage print high top and low cut chucks. 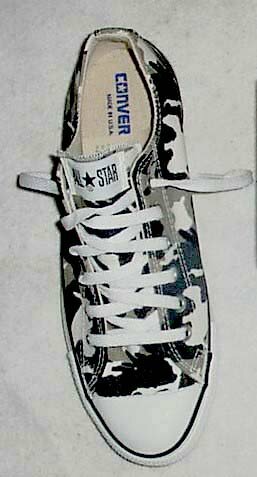 1 Camouflage Chucks Left blue camouflage high top, inside view. 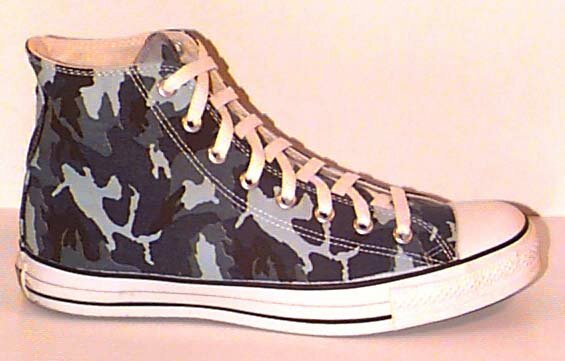 2 Camouflage Chucks Left blue camouflage high top, outside view. 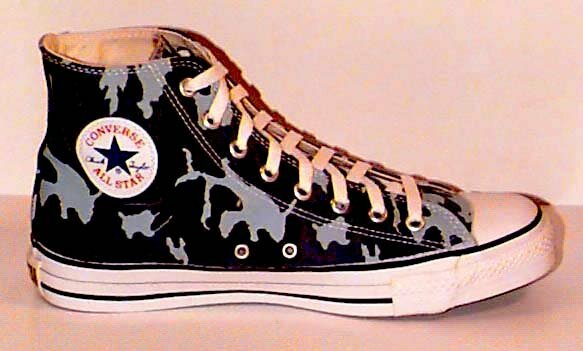 3 Camouflage Chucks Right blue camouflage high top, inside view. 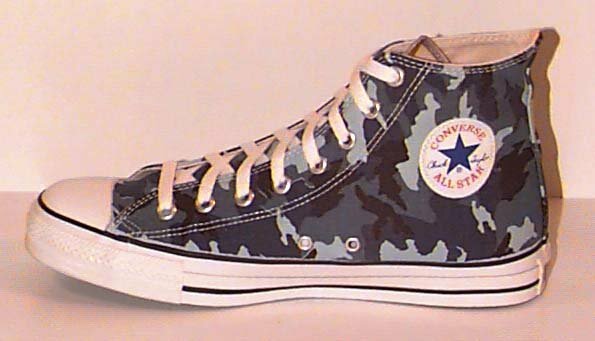 4 Camouflage Chucks Right blue camouflage high top, outside view. 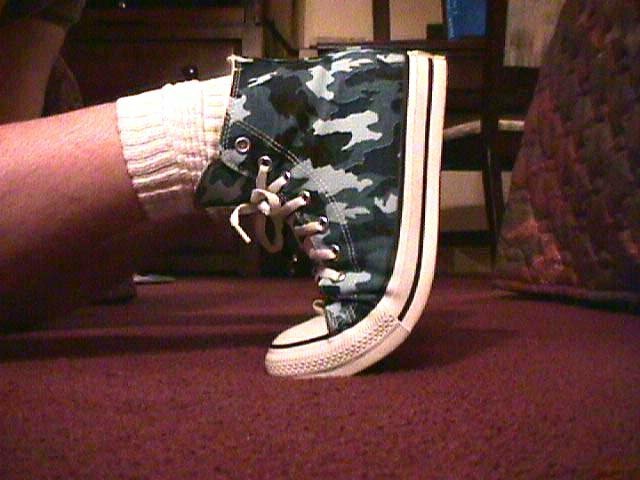 5 Camouflage Chucks Blue camouflage high tops, angled front view. 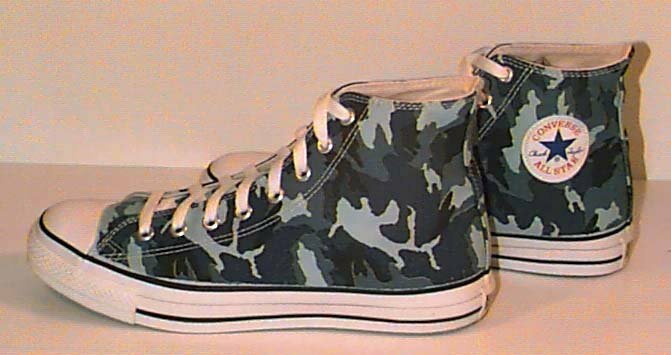 6 Camouflage Chucks Blue camouflage high tops, side view. 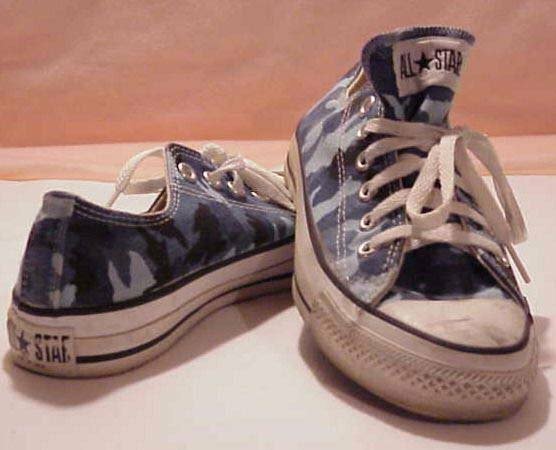 7 Camouflage Chucks Blue camouflage high tops, front view. 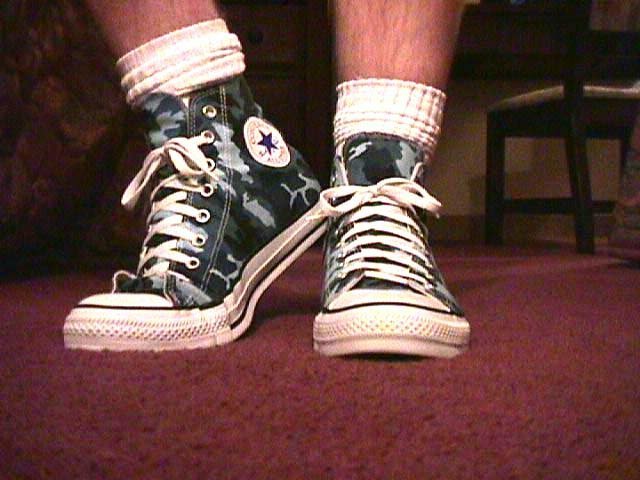 8 Camouflage Chucks Blue camouflage high tops, rear view. 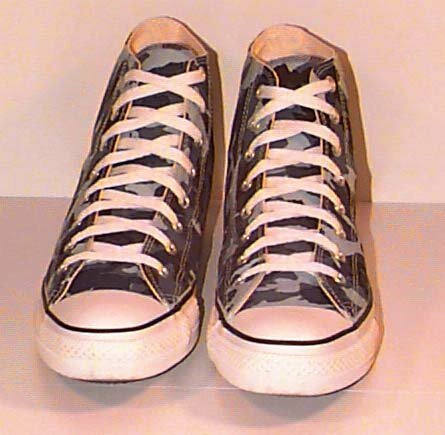 9 Camouflage Chucks Wearing blue camouflage high tops, left outside view. 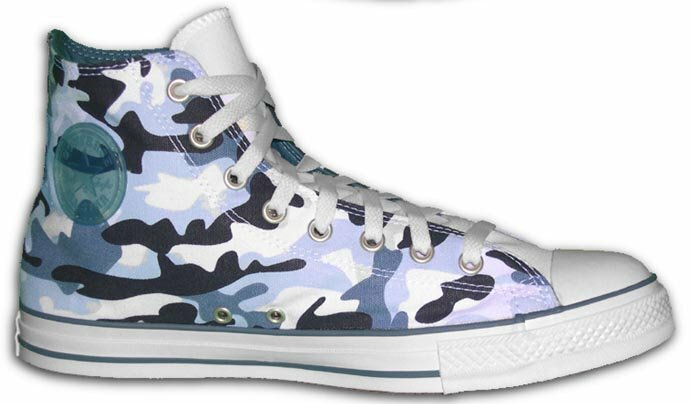 10 Camouflage Chucks Blue camouflage high tops, angled side view. 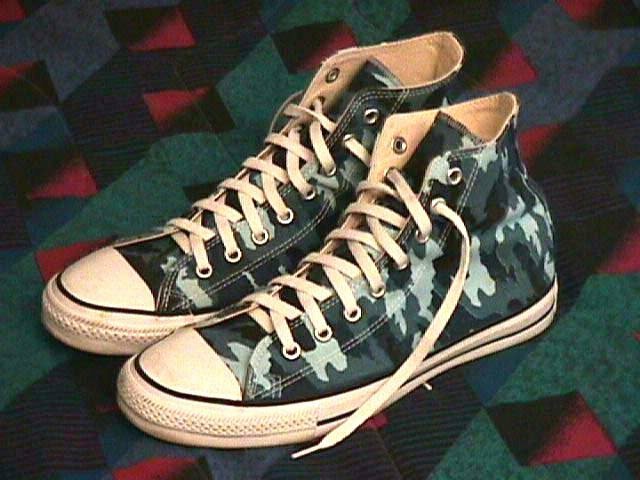 11 Camouflage Chucks Wearing blue camouflage high tops, front view. 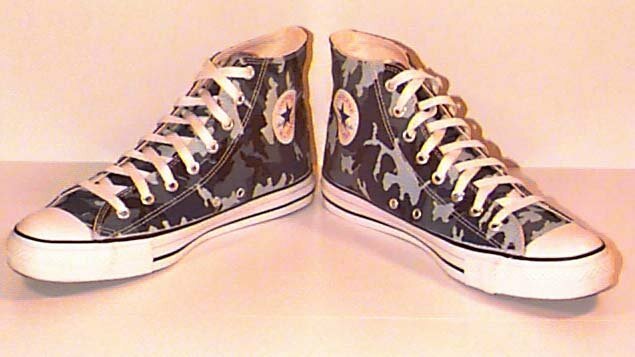 12 Camouflage Chucks Wearing blue camouflage high tops, right side view. 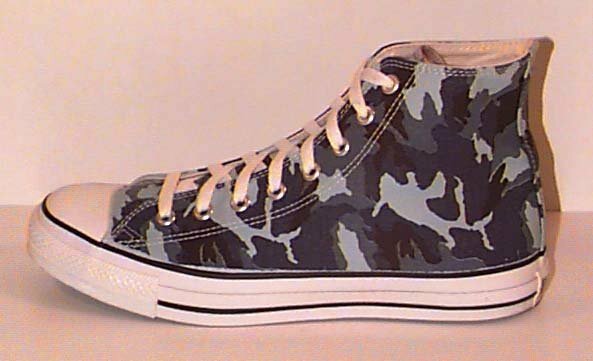 13 Camouflage Chucks Inside patch view of a left blue camouflage high top with a white tongue. 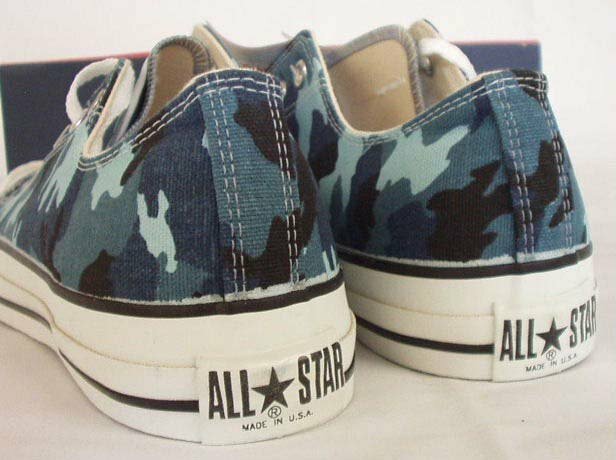 14 Camouflage Chucks Blue camouflage low cuts, front and side views. 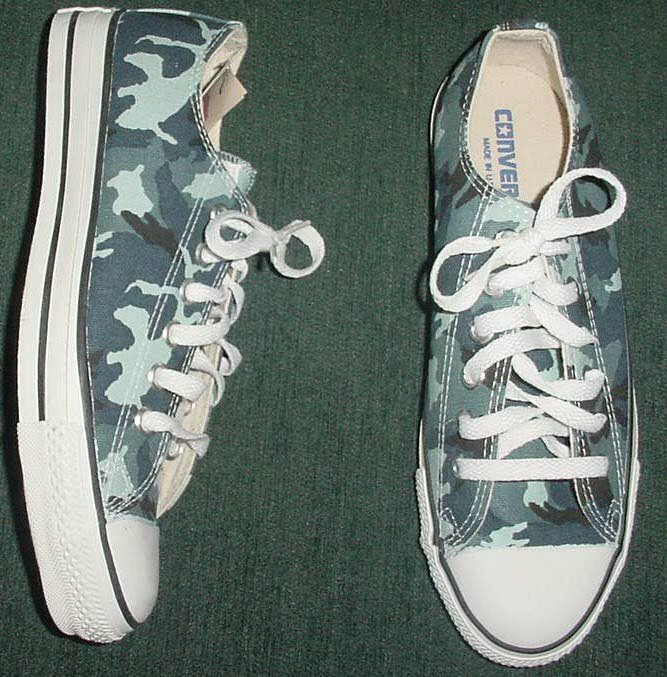 15 Camouflage Chucks Blue camouflage low cuts, top and side views. 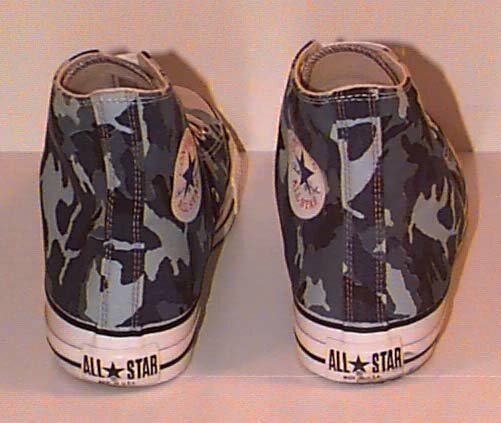 16 Camouflage Chucks Blue camouflage low cuts, rear view. 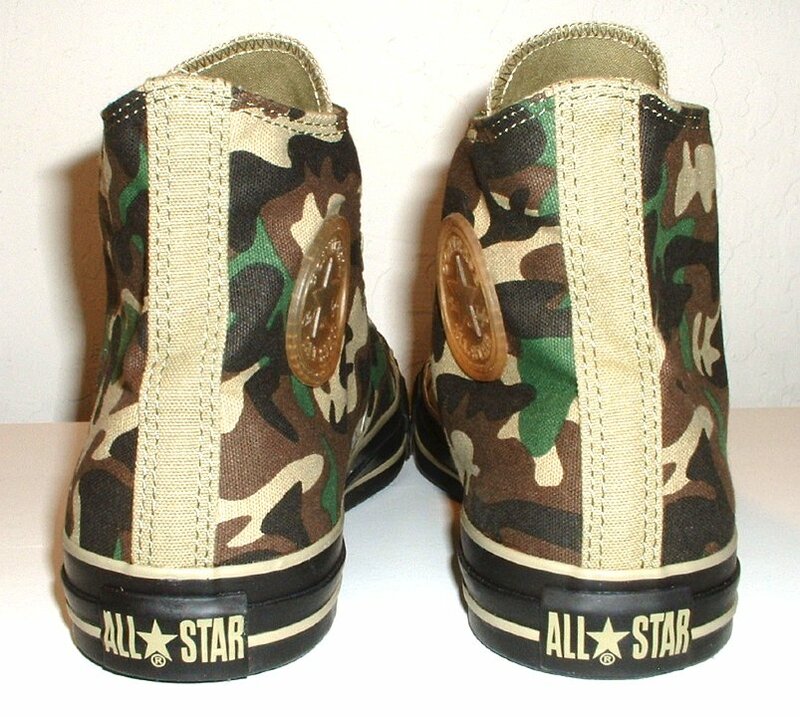 17 Camouflage Chucks Brown camouflage high top, right inside view. 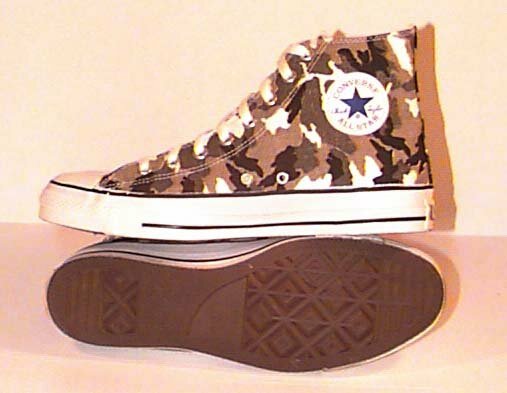 18 Camouflage Chucks Brown camouflage high top, right outside view. 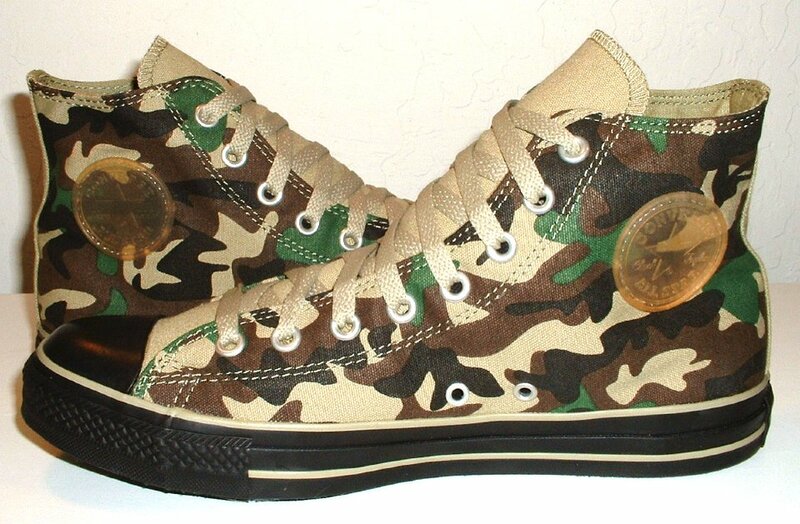 19 Camouflage Chucks Left brown camouflage high top, inside view. 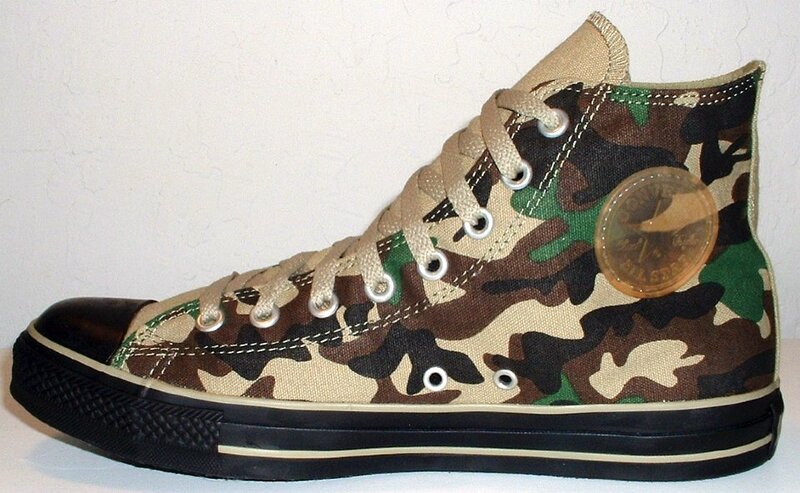 20 Camouflage Chucks Left brown camouflage high top, outside view. 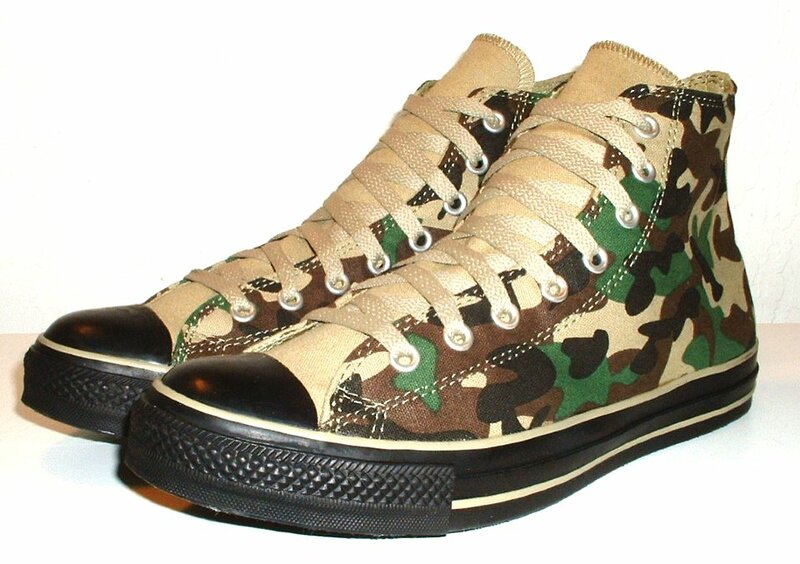 21 Camouflage Chucks Brown camouflage high tops, angled front view. 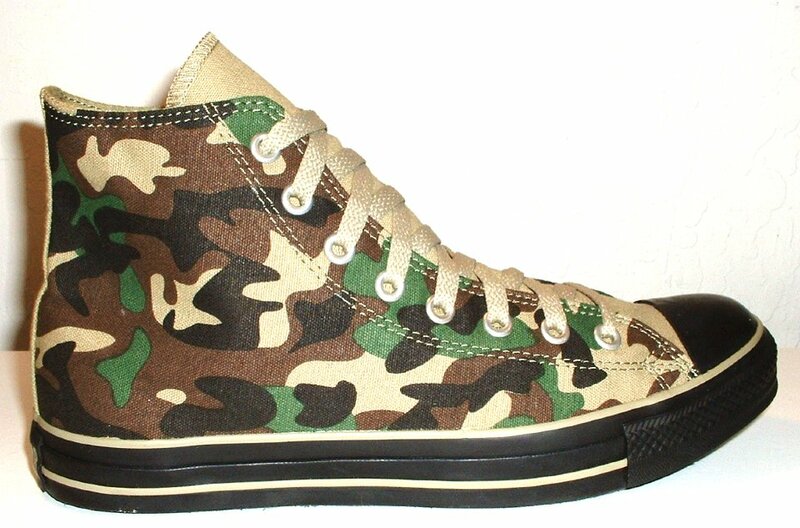 22 Camouflage Chucks Brown camouflage high tops, right inside and sole views. 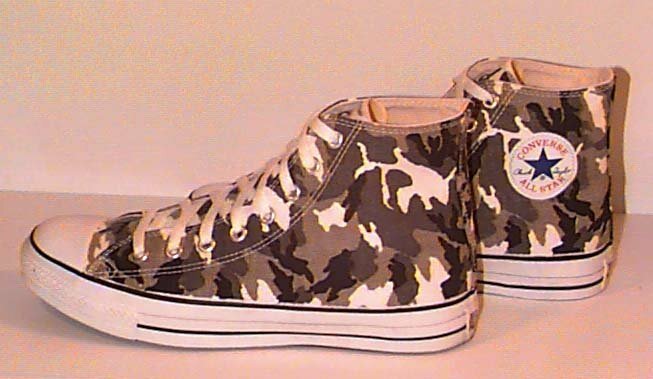 23 Camouflage Chucks Brown camouflage high tops, side view. 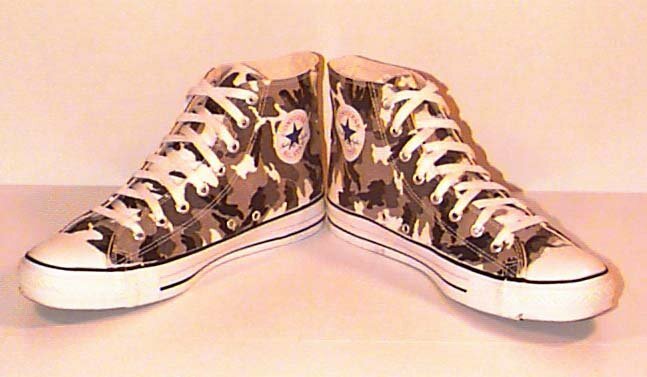 24 Camouflage Chucks Brown camouflage high tops, front view. 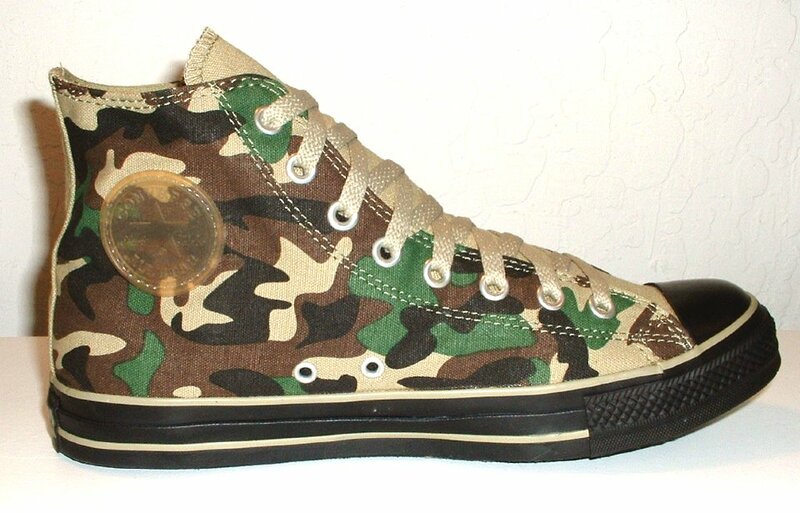 25 Camouflage Chucks Brown camouflage high tops, rear view. 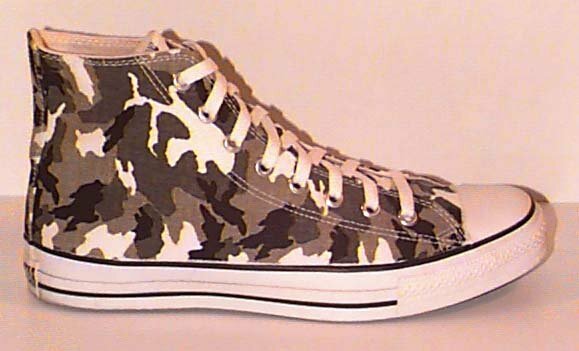 26 Camouflage Chucks Brown camouflage high tops, angled side view. 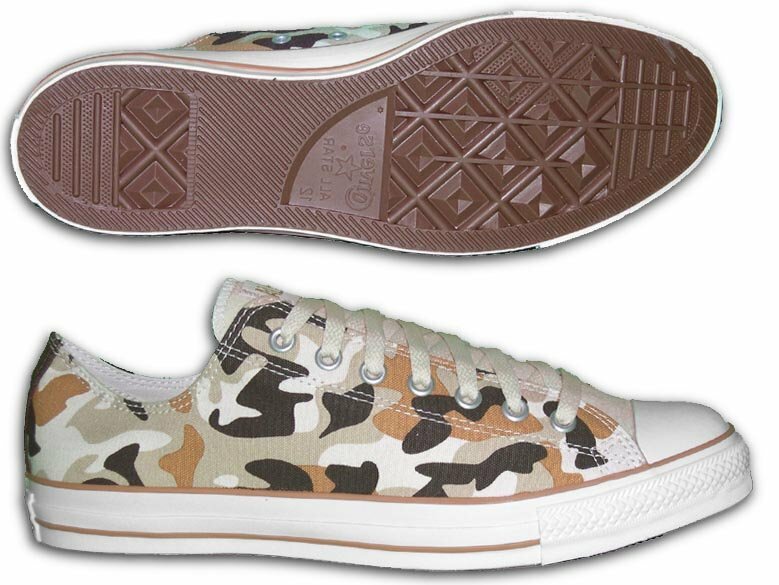 28 Camouflage Chucks Brown camouflage low cut, top view. 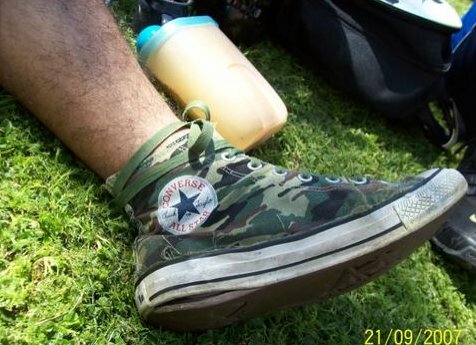 29 Camouflage Chucks Several views of knee high camouflage chucks. 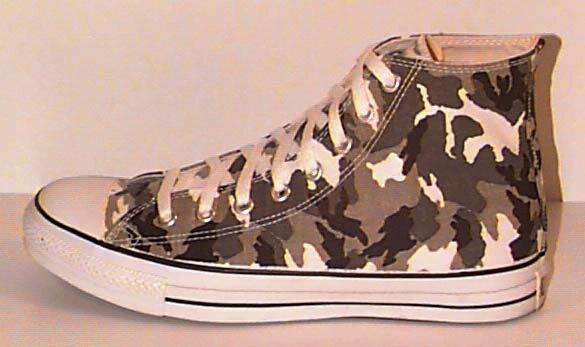 30 Camouflage Chucks Inside patch view of a left desert print camouflage high top. 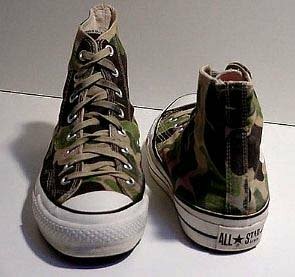 31 Camouflage Chucks Side and sole views of desert print low cut chucks. 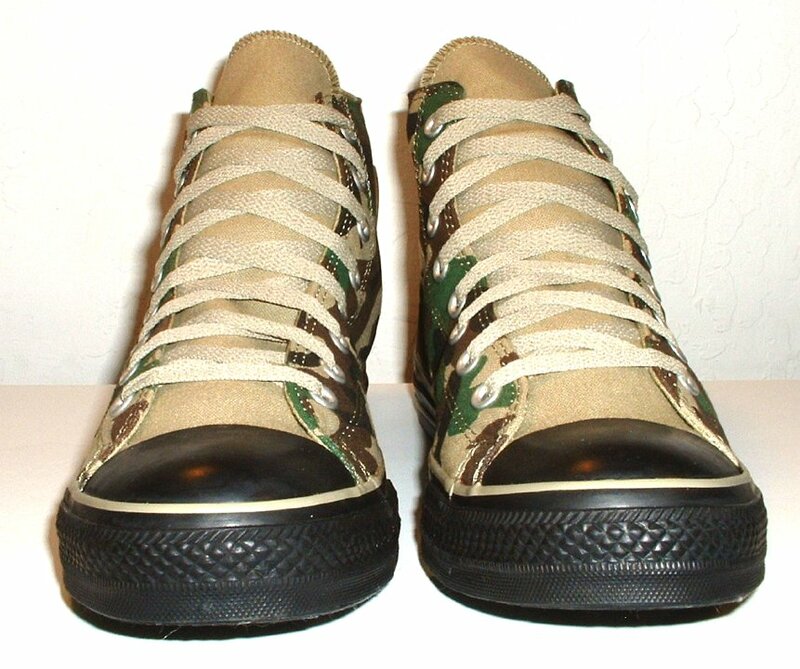 32 Camouflage Chucks Worn green camouflage high tops, rear view. 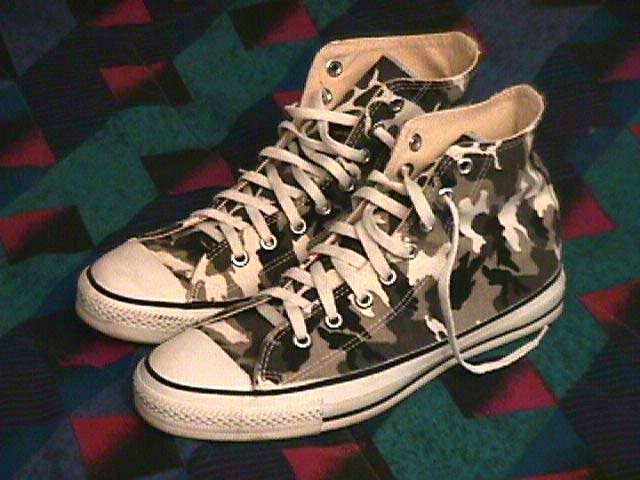 33 Camouflage Chucks Worn green camouflage high tops, front view. 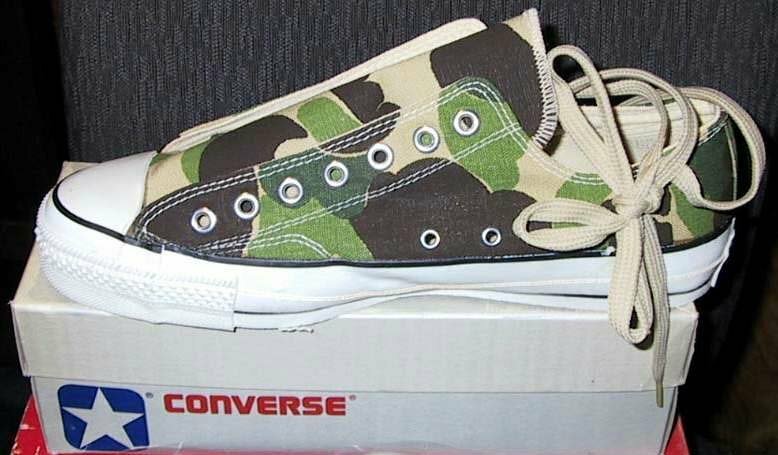 34 Camouflage Chucks Green camouflage high tops, angled side view. 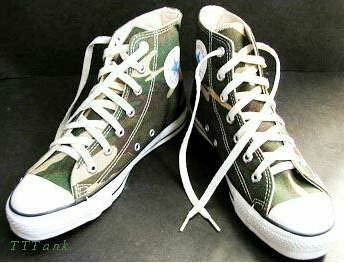 35 Camouflage Chucks Green camouflage high tops, front and rear views. 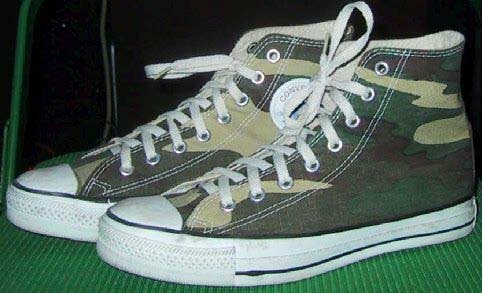 36 Camouflage Chucks Green camouflage high tops, right inside and sole views. 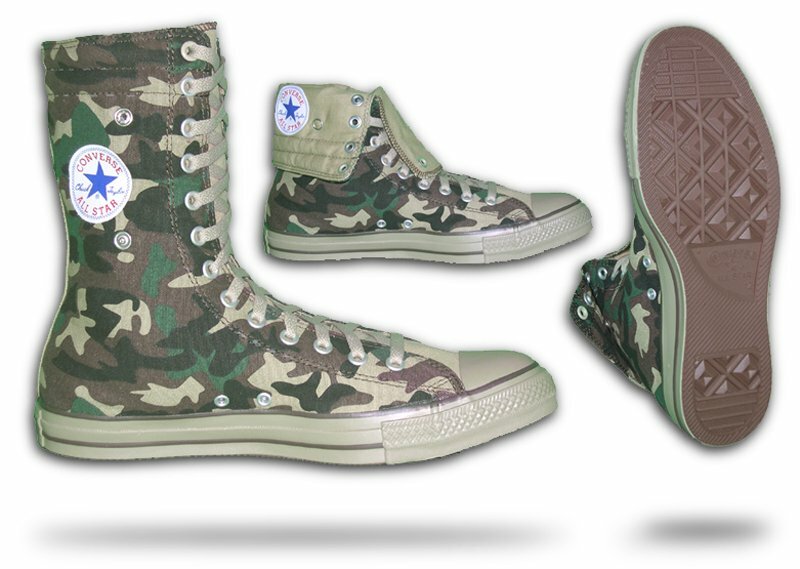 37 Camouflage Chucks Green camouflage high tops, jungle pattern, right inside and sole views. 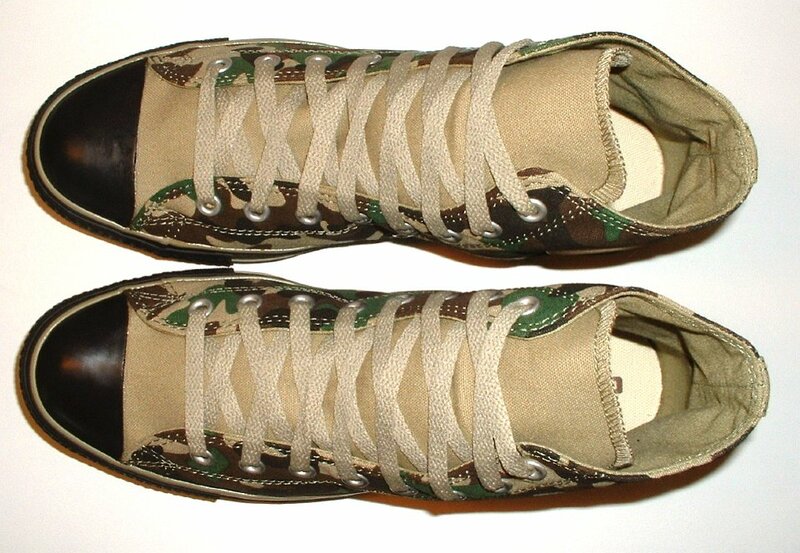 38 Camouflage Chucks Green camouflage high tops, jungle pattern, side view. 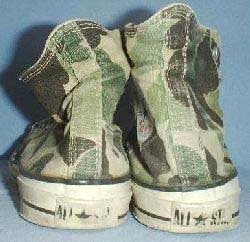 39 Camouflage Chucks Worn green camouflage high tops, inside patch view. 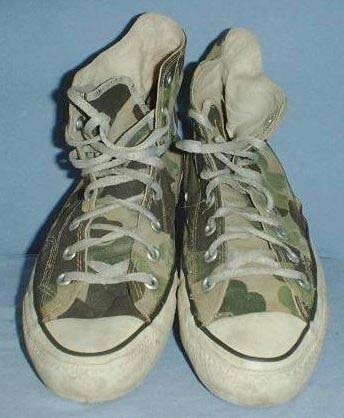 40 Camouflage Chucks Worn green camouflage high tops, side view. 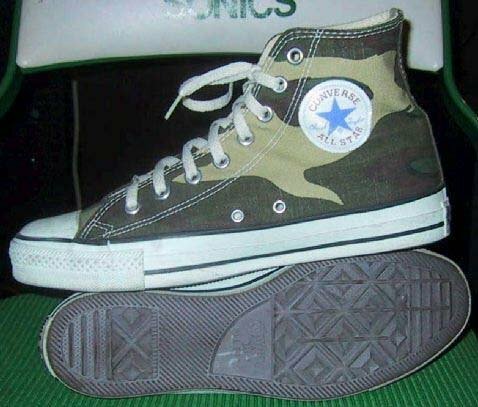 41 Camouflage Chucks Green camouflage high tops, angled front view. 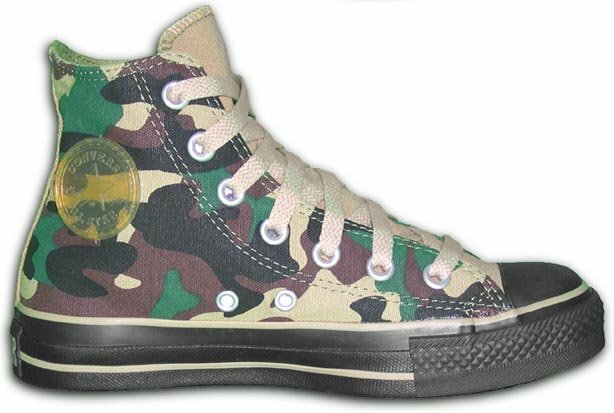 42 Camouflage Chucks Left green camouflage high top, inside patch view. 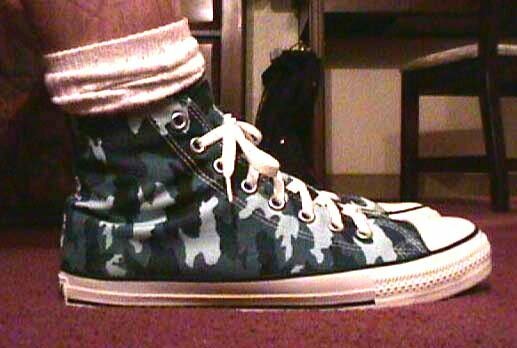 43 Camouflage Chucks Green camouflage high tops, angled side view. 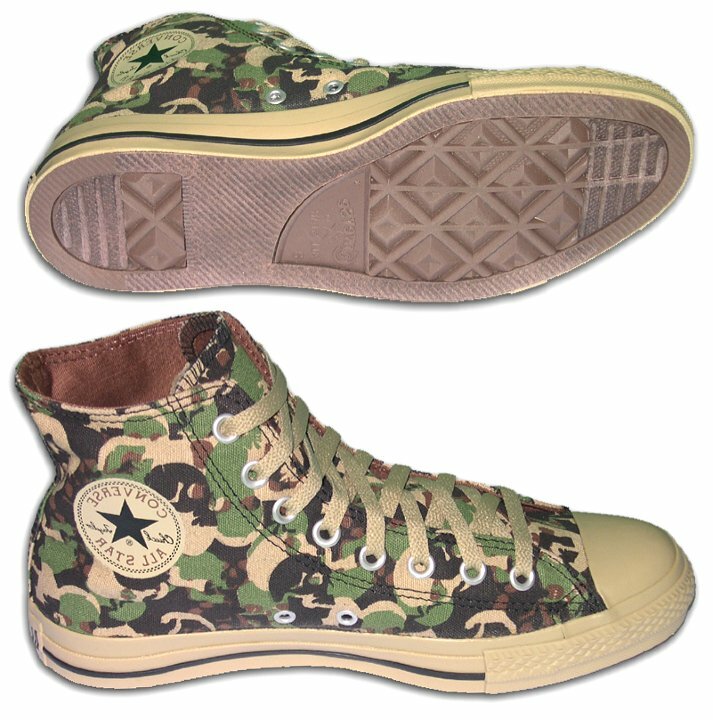 44 Camouflage Chucks Inside patch views of green camouflage high tops. 46 Camouflage Chucks Inside patch view of a left green camouflage high top. 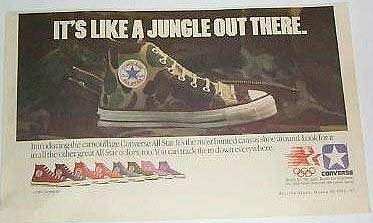 47 Camouflage Chucks Advertisment for green camouflage high tops. 48 Camouflage Chucks New green vintage camouflage low cut, side view. 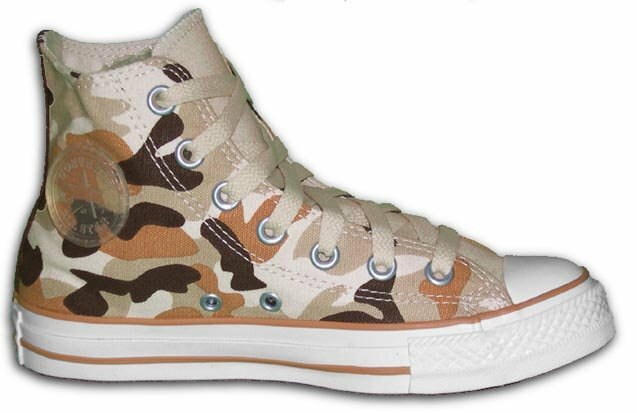 49 Camouflage Chucks Inside patch view of a left light olive camouflage high top. 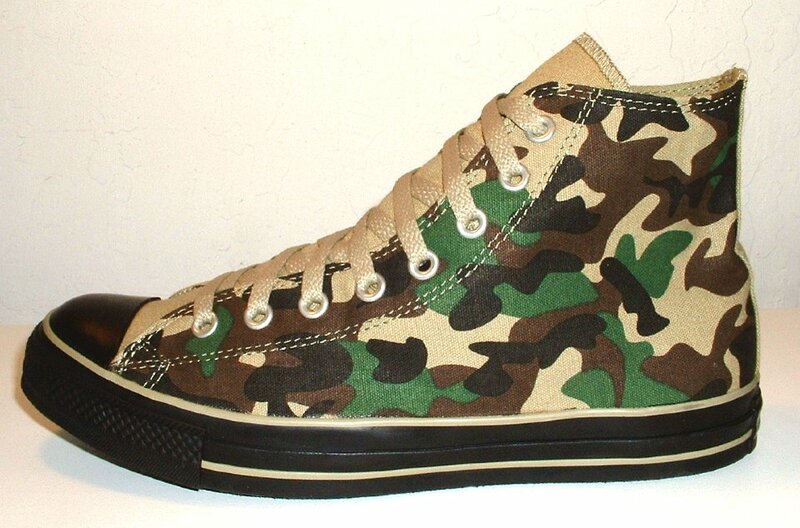 50 Camouflage Chucks Side view of a right light olive camouflage low cut. 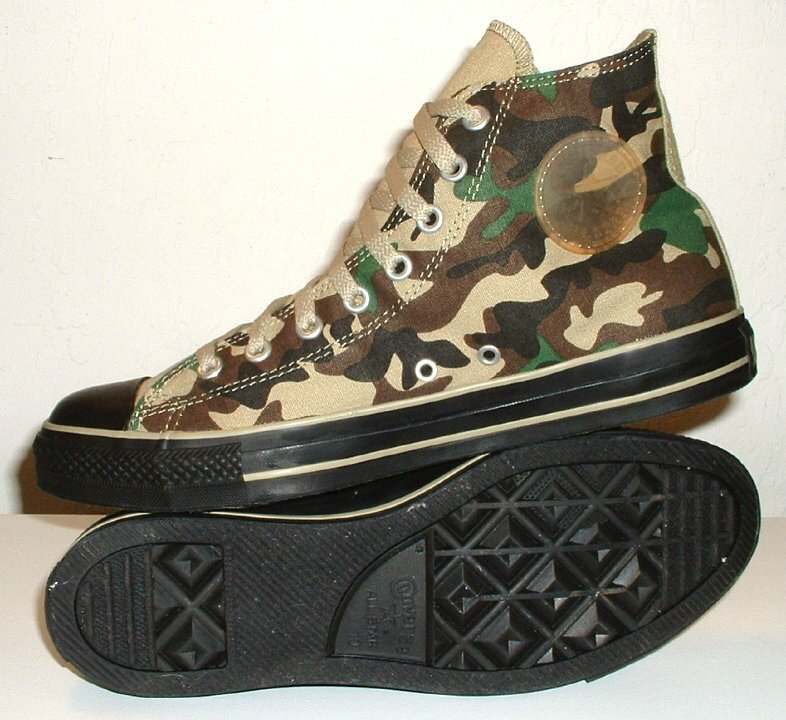 51 Camouflage Chucks Inside patch view of a right olive green camouflage high top. 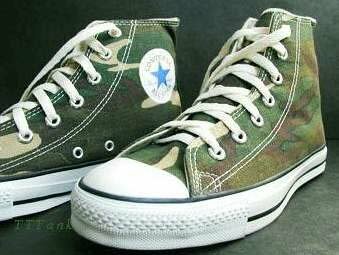 52 Camouflage Chucks Outside view of a right olive green camouflage high top. 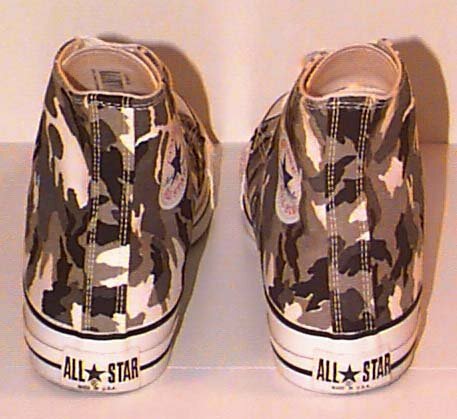 53 Camouflage Chucks Inside patch view of a left olive green camouflage high top. 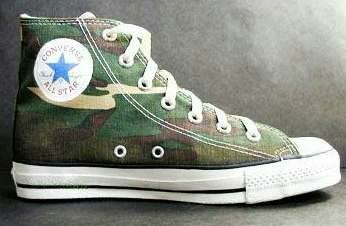 54 Camouflage Chucks Outside view of a left olive green camouflage high top. 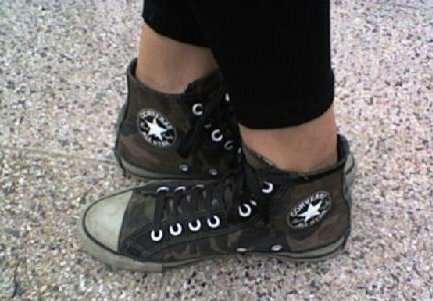 55 Camouflage Chucks Rear view of olive green camouflage high tops. 56 Camouflage Chucks Front view of olive green camouflage high tops. 57 Camouflage Chucks Angled side view of olive green camouflage high tops. 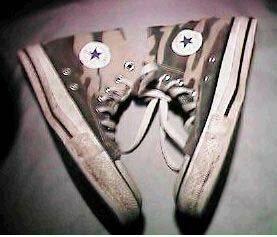 58 Camouflage Chucks Top view of olive green camouflage high tops. 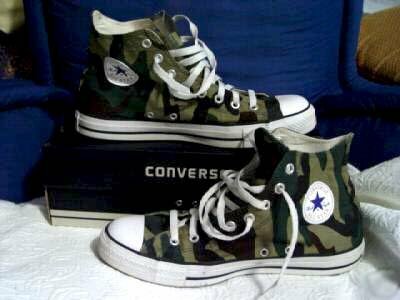 59 Camouflage Chucks Angled front view of olive green camouflage high tops. 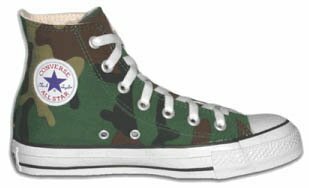 60 Camouflage Chucks Inside patch views of olive green camouflage high tops. 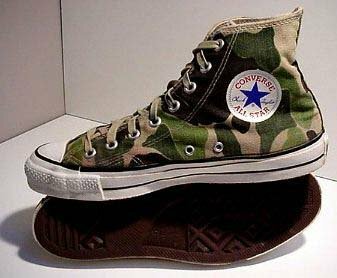 61 Camouflage Chucks Inside patch and sole views of olive green camouflage high tops. 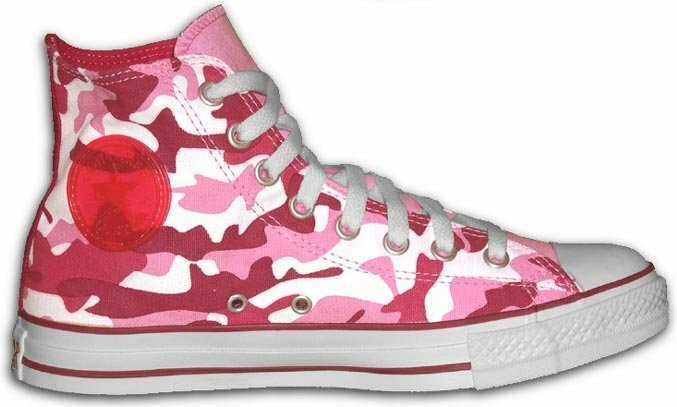 63 Camouflage Chucks Side view of a right pink camouflage low cut. 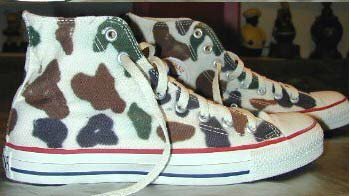 64 Camouflage Chucks Inside patch and sole views of green skull camouflage high top chucks. 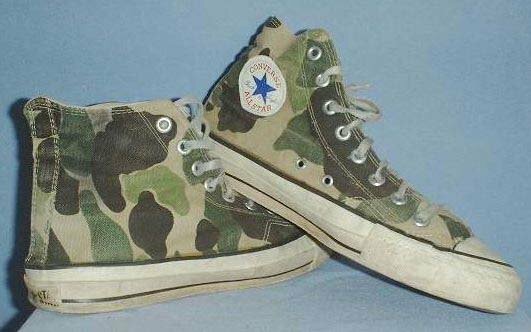 65 Camouflage Chucks Wearing green camouflage high tops. 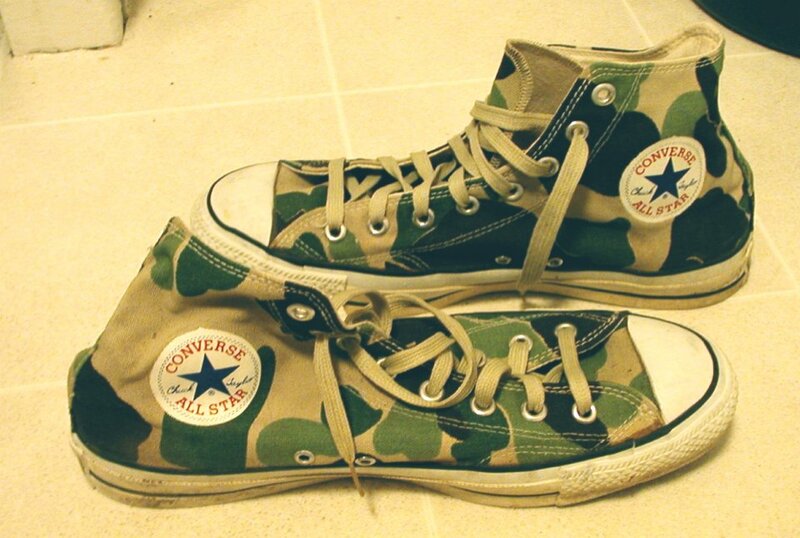 66 Camouflage Chucks Wearing green camouflage high top chucks. 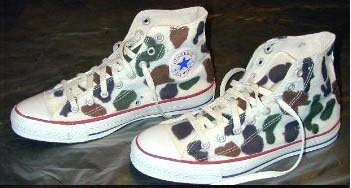 67 Camouflage Chucks White camouflage high tops, angled side views. 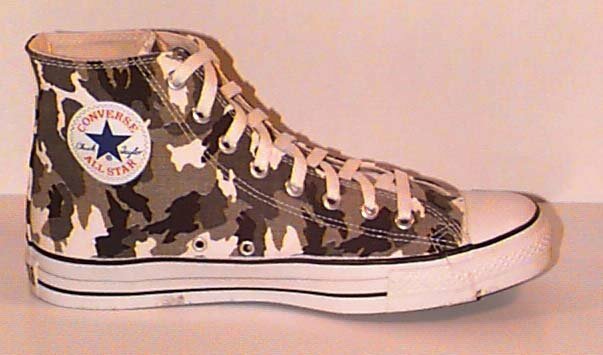 68 Camouflage Chucks White camouflage high tops, angled inside patch views. 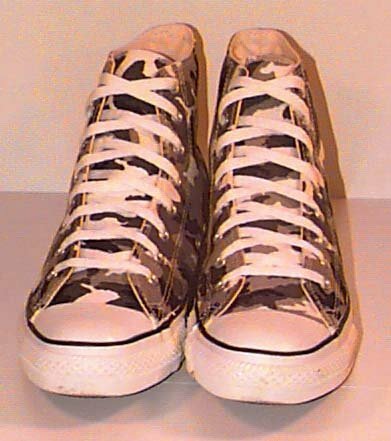 69 Camouflage Chucks White camouflage high tops, outside view. 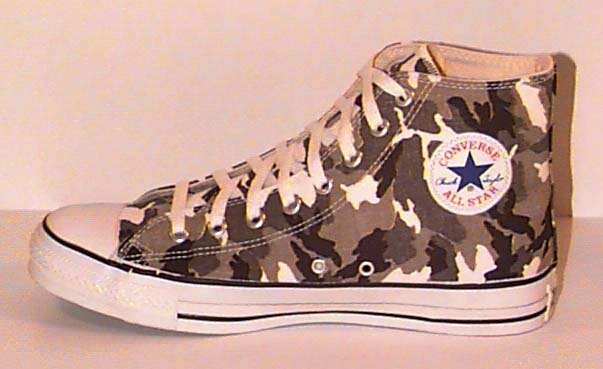 Over the last several decades, Converse has produced a variety of camouflage print chucks in both high top and low cut versions.